For young writ­ers who aspire to write infor­ma­tion books of their own, or read­ers who will enjoy the expe­ri­ence of read­ing more, we’d like to help them under­stand how a book design­er works. Mar­ty Ittner designed Untamed: the Wild Life of Jane Goodall and gra­cious­ly agreed to answer bookol­o­gist Vic­ki Palmquist’s ques­tions. 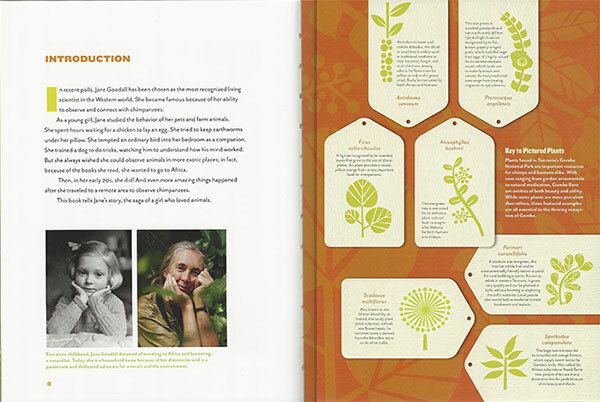 When you start the process of design­ing a book, what pro­vides your inspi­ra­tion? The design process actu­al­ly begins in the mid­dle of a book’s life. The project has already been con­ceived, researched and approved by the author and pub­lish­er to make sure it is a sto­ry worth the invest­ment. So when the design­er first receives the text and pho­tos, it is impor­tant to hon­or the life of the book and the author’s vision. There­fore most of the inspi­ra­tion comes from com­ing to know the sto­ry, and how to tell it visu­al­ly. Sim­ply put, inspi­ra­tion comes from with­in the book itself. How do you phys­i­cal­ly orga­nize your ideas for the book lay­out? At first I will do some rough pen­cil sketch­es in my Mole­sk­ine note­book, along­side the notes tak­en from ini­tial dis­cus­sions with the book team. But by and large the ideas are col­lect­ed dig­i­tal­ly in InDe­sign (a page lay­out pro­gram) and Pho­to­shop, a pro­gram which enables adjust­ments to pho­tographs such as adding col­or to an old black and white pho­to. Do you start by know­ing the book will be a cer­tain size and num­ber of pages or do you decide the size and num­ber of pages after you’ve exam­ined the con­tent and cre­at­ed a rough design? Nation­al Geographic’s mar­ket­ing and dis­tri­b­u­tion teams deter­mine the size and num­ber of pages before it reach­es the design­er. These spec­i­fi­ca­tions are based on a long his­to­ry of pub­lish­ing and review­ing sim­i­lar books and prod­ucts. There’s a lot of space on many pages where there is no print­ing and no pho­tographs: white space. Why is this impor­tant to you? That’s fun­ny, because to me this book is brim­ming with col­or and images, com­pared with books that are designed for adults, which have much more white space. I wouldn’t fill an entire room with fur­ni­ture or sur­vive with­out sleep. Space is sim­ply the absence that allows us to see what is present. You’ve used a graph­ic, screened back to 15% or 20% of a sol­id hue to lay behind the pri­ma­ry ele­ments on many pages. What does this do for the read­er? On the first sketch­es for the book, I includ­ed some exot­ic vines and leaves that were meant to set the stage for Jane’s time in the jun­gle. The book team liked the idea and decid­ed to take it fur­ther by hir­ing an illus­tra­tor (Susan Craw­ford) to draw the spe­cif­ic plants found in Gombe Nation­al Park, where Jane was study­ing the chimps. At first the read­er may only see them as a back­ground, but even­tu­al­ly may devel­op a curios­i­ty to find out more, much like Ms. Goodall’s own work and note­books. 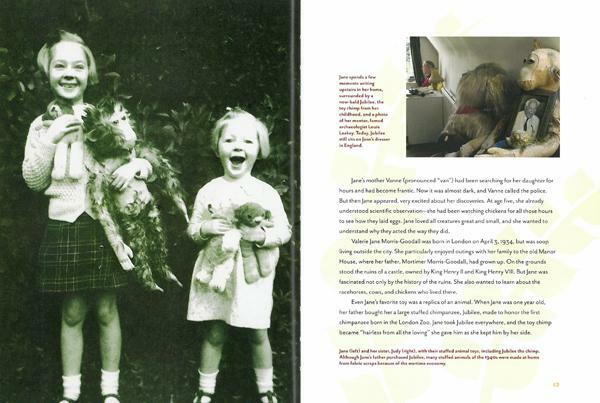 We went so far as to include a page describ­ing each plant, some of which pro­vide food and shel­ter for the chimps. In this way, the read­er can dis­cov­er more about life in the jun­gle, and the inter­de­pen­dence of all species. On some pages a pho­to cov­ers the entire page. On oth­er pages, a pho­to may take 1/12th or ¼ of the page. How do you make deci­sions about how big the pho­tos will be? In children’s books, we use what’s called “track­ing”, which is that a pho­to must be on the same spread as its men­tion. For exam­ple, the pho­to of Jane with her stuffed toy Jubilee would run next to the text “her father bought her a large stuffed chim­panzee”. This can some­times be tricky, but for­tu­nate­ly I love solv­ing puz­zles. The oth­er fac­tor is the qual­i­ty of the image. We will high­light good images by run­ning them large and min­i­mize pho­tographs that don’t have the best qual­i­ty. Do you work on a grid? Absolute­ly! Struc­ture and form are the under­pin­nings that make a book cohesive—creating a rhythm that is inher­ent­ly felt. The reg­u­lar­i­ty of the grid cre­ates an ease of entry for the read­er, as their eyes are not jump­ing around. What com­put­er pro­gram do you use to lay out the book? Do you do any of your work by hand? I love the feel of a book as an object. So when design­ing, I always print and trim out the pages with an xac­to knife to see how they will look in the final book. When a read­er picks up Untamed, how do you hope the book’s design will affect them? It was a great hon­or to work with Nation­al Geo­graph­ic and Ani­ta Sil­vey to tell the impor­tant sto­ry of Jane Goodall and her beloved chimps. It touch­es on com­pas­sion, the envi­ron­ment, ani­mal rights and the strength of a remark­able woman. My hope is that the design delights and car­ries the read­er through the whole sto­ry. In this way, we can hope to inspire a new wave of com­pas­sion­ate con­ser­va­tion­ists. We were pleased to fea­ture your work. We’re also pleased that Untamed is receiv­ing so much recog­ni­tion. It’s a beau­ti­ful, infor­ma­tive book.